PAINT | Ouch!! My back hurts!! Below is an extract from a post in August last year. When I set eyes on Ailsa’s challenge this week I knew where I was going with today’s post. You see… the dreaded canvas I speak about has come out of hiding. I’ve been working on it for more than a month. Slowly but surely the paint is finding it’s pattern on the canvas. I’ll begin today by divulging a secret… no, it’s nothing earth shattering. Actually, to many, it’s not even a secret. I have, in the past, been known to slap paint on the odd canvas, occasionally with mild success. I’ve not attempted anything remotely artistically connected with a piece of paper or canvas for quite some time but the other day I was walking past the sale bins in the local store when a large canvas stopped me in my tracks and begged to be taken home. So… thanks to Ailsa’s challenge this week… I now have an excuse to show you the progress. Paint… it’s such an important part of life… primary colours included! PS – This “painting” is inspired by Piet Mondrian… he’s art has had a massive effect on how I look at lines… in life and art. PSS – This bit of paint on canvas is not complete… maybe I’ll get it done before Christmas… maybe I won’t! 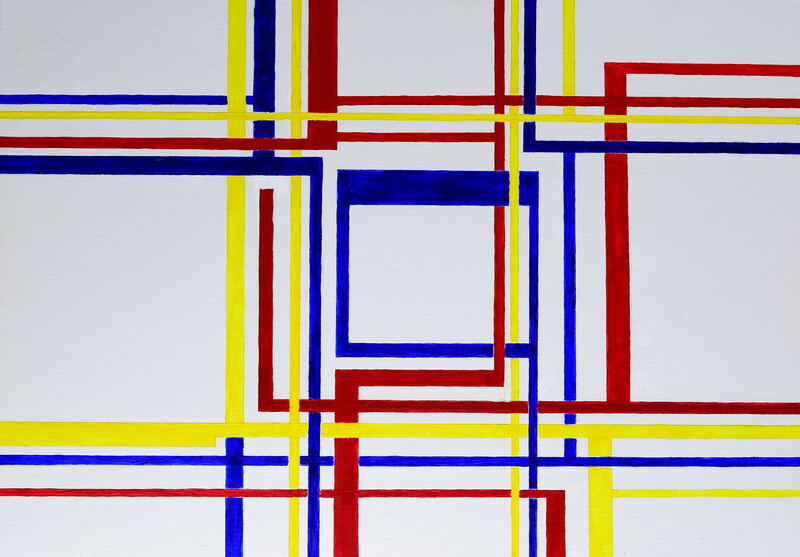 This entry was posted in Art, Factual Opinion, Family & Life, Travel and tagged #blog buddies, #blogging, #blue, #challenge, #change, #colour, #creative juices, #inspiration, #my blog, #passion, #red, #travel 🛫, #yellow, Art, painting, Piet Mondrian. Bookmark the permalink. Thnaks… no, it’s by no means easy! Free-handing straight lines takes time!! It’s fun and it is taking me in an interesting direction… think Mondrain meets Pollock!!! Beautiful post! Sometimes it’s not easy to begin but once started, ideas coming flooding. Happy painting! Oh yes, I hear it begging for more lines. Or maybe that is it’s appeal – it feels unfinished and is begging us to add our thought lines. Well, aj, I suggest you take my photo and write your interpretation on your blog! I would love to see what you do with it.